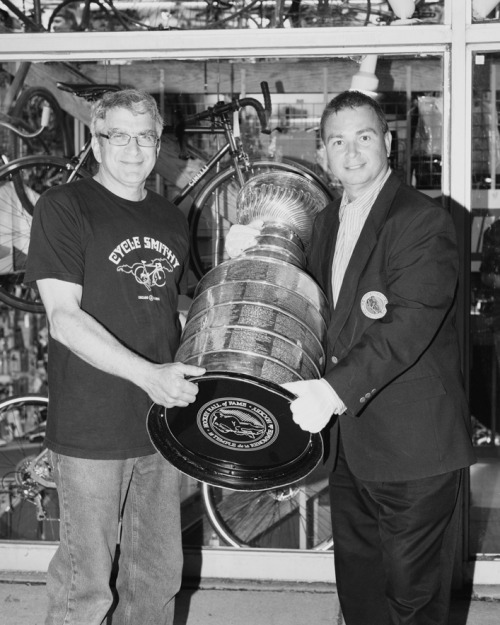 Cycle Smithy meets the Stanley Cup! Over this past summer, the Chicago Blackhawks won the Stanley Cup. Unfortunately, after they won, a few people took it upon themselves to break some windows in the Lincoln Park neighborhood, our storefront being a victim. As a kind gesture, the cup made its rounds down Clark St., and we were fortunate enough to host it at the shop for a few minutes. Clearly, everyone was very excited.